Government and the agriculture industry have a long history, and a bright future, of working together! The goal of Public Officials Day at the Farm Show is to further strengthen the relationship between those in agriculture and those in government. As in the past, this day will provide an opportunity for public officials to network with industry members and other officials from local, state, and federal government. Township officials are invited to visit the Farm Show to network and attend a luncheon, beginning at 11:00 AM, in the PA Preferred® Banquet Hall of the Pennsylvania Farm Show Complex and Expo Center. Reservations for the Public Officials Day Luncheon can be made using EventBrite: https://2019podluncheon.eventbrite.com by January 2, 2019. Please contact Stephanie Zarefoss at szarefoss@pa.gov with any questions. TVN: Is Your Township Ready to Get Organized? from PSATS Video on Vimeo. ​Officials representing townships of the second class in Clarion County will meet Thursday, September 27, 2018, at the Knox Fire Hall, Knox, PA for their 98th Annual County Convention. The purpose of the annual convention is to provide township officials with up-to-date information to help them better serve their residents and to give them an opportunity to exchange ideas on local government issues. Purpose: To recognize youth groups that make valuable and lasting contributions to improve life in Pennsylvania’s townships of the second class. The awards program encourages greater youth involvement in township government. ​Eligible Entrants: All youth groups, such as 4-H clubs, Scout troops, school groups, and civic service club youth organizations from elementary school through grade 12, are eligible. The association of township officials in the entrant’s county must nominate the group for the award. The county association may initiate the nomination or the youth group may ask to be nominated. ​Eligible projects must have been undertaken during the contest year, August 1 to July 1. Multi-year, ongoing projects also are eligible provided part of the project occurred during the contest year. The project must have a major impact on townships of the second class and should provide youth group members with the opportunity to increase their knowledge of township government as well as develop a sense of personal and group achievement. Projects also should enhance the group members’ communication skills, their understanding of the decision-making process, and citizenship responsibilities. Projects that help to finance local government programs. How to Enter: Official entry forms are mailed to county associations, Boy and Girl Scout troops, schools, and 4-H clubs statewide in May. Forms can also be obtained by calling PSATS at (717) 763-0930. To enter, a group should complete the official form and have it signed by the group’s youth project or activity chairman, the group’s volunteer leader, and the chairman of the township board of supervisors. Entrants should then submit the entry form along with documentation of the project to the county association of township officials. Deadline for Entry: All youth groups must submit their entry form to the president of their respective county association of township officials by July 2, 2018. County associations of township officials must submit the entry form to PSATS by July 16, 2018. Click here for the 2018 guidelines and entry form. Contact Brenda Wilt, PSATS Assistant Editor, phone (717) 763-0930, ext. 123, email bwilt@psats.org. TVN: Howdy from the 2018 PSATS Conference from PSATS Video on Vimeo. -Largest municipal trade show in PA.
-Networking with 4,000+ township officials, employees & vendors. ​How do you legally establish speed limits on municipal roads? How do you properly place Stop signs? What are the problems associated with improper use of multiway Stop signs? This course answers these questions and more, by demonstrating how to conduct basic engineering and traffic studies for establishment of regulatory signs on municipal roads. It reviews applicable laws, ordinances, regulations and required study procedures for establishing, revising and removing traffic restrictions, as presented in PennDOT Publication 212, Official Traffic Control Devices. Participants also complete exercises in which they perform common engineering and traffic studies using real data. This workshop is open to all municipal governments – townships, boroughs and counties. Please share with your neighboring municipalities. Please contact Karen Lue Wilson, Clarion Township Secretary, at clariontownship@comcast.net to RSVP if you are attending. ﻿﻿After about two years of working with an external consultant and input from the community, Clarion County Commissioners recently approved an amended Clarion County Subdivision and Land Development Ordinance (SALDO) and got what it was looking for – a more user friendly document. The original SALDO was adopted in 1971 and amended in 1972, 1976, 1983, and 2005. A copy of the ordinance is available on the Clarion County website by clicking here. The amended SALDO also includes a new classification, called minor land developments that may allow certain small, simple projects to be reviewed and approved by Planning Department staff. This will allow these projects to proceed faster, since they will not have to be approved by the Planning Commission at one of their regular monthly meetings. Several requirements were modified to more realistic standards. The road section has been cleaned up and simplified. The process changes from 2007 and recording, road naming, parcel numbering, and latitude and longitude changes from 2012 are incorporated in the amended SALDO. The amended SALDO property reflects the storm water management and erosion and sedimentation control requirements since the Clarion Conservation District conservation is now administering the 2012 Clarion County Stormwater Management Plan. ​The amended SALDO has been updated to reflect changes in the Pennsylvania Municipalities Planning Code in any legal decisions since the current essay SALDO was adopted. You are invited to participate in the 12th Annual Northwest Pennsylvania GIS Conference that will be held on October 19-20, 2017 at Clarion University of Pennsylvania. This link is the formal conference announcement and the preliminary deadlines for registration and material submissions. For more information click on link below. This conference presents some of the best Geographic Information System (GIS) practices in our community today. Randall Stahlman, David Dunn and Denny Logue from Clarion County OES will be presenting a workshop to help local municipalities be prepared in the event of natural disaster, weather related events, epidemics, infrastructure failure, etc. Please register for this workshop at (814) 764-5222. ​This course provides the basics for developing a road surface management program to help local governments manage their pavements by providing an understanding of the concept and importance of road surface inventories and condition surveys. A review of the basic components of flexible and rigid pavements is discussed. Pavement condition evaluations and how to recognize common pavement distress is presented. Sample pavement ratings are performed by the participants. Repair strategies at the system and project level are discussed using the information presented in the course. This course identifies various types of geosynthetic materials used in road maintenance operations. Attendees will gain the knowledge and understanding of the common types of geosynthetic materials as well as their applications and functions. Instructors will review the cost benefits in using geosynthetics in the preventive maintenance of roadway structures. Such uses of geosynthetics as subsurface drainage, subgrade stabilization, soil reinforcement, erosion and sedimentation control, and paving fabric will also be discussed. ​Officials representing townships of the second class in Clarion County will meet Thursday, September 28, 2017, at the Knox Fire Hall, Knox, PA for their 97th Annual County Convention. The purpose of the annual convention is to provide township officials with up-to-date information to help them better serve their residents and to give them an opportunity to exchange ideas on local government issues. Clarion County has many opportunities for anyone considering a run for a political office in the May 16, 2017 municipal primary elections. Nomination petitions are available at the Clarion County Administrative Building at 330 Main Street, Room 104, in Clarion. The first day to circulate nomination petitions is February 14, and the last day to circulate and file nomination petitions is March 7 at 4:30 p.m. For more information, call 814-226-4000, extension 2006, or email ccallihan@co.clarion.pa.us. Township Offices include: Township Supervisor, Township Auditor and Tax Collector. ​ Citizen's Guide to PA Local Government and Elective Office in Local Government. LTAP is hosting a workshop on The FHWA rules about traffic sign maintenance, asset management, and retroreflectivity standards. ​The Federal Highway Administration (FHWA) has established new rules about traffic sign maintenance, asset management, and retroreflectivity standards. The LTAP Conducting Sign Retroreflectivity Inspections course will instruct municipal staff on these requirements, reinforce the value of a useful traffic sign asset management system, and demonstrate the tools and techniques available for measuring traffic sign retroreflectivity. Further, the course will present the concepts of luminance and retroreflectivity, providing a foundation for understanding the value of certain testing and measuring methods. Intended Audience: Local government officials responsible for installation, maintenance, and inspection of traffic signs, roadway safety, and asset management. This includes traffic technicians, public works directors, supervisors, roadmasters, and crew responsible for traffic signs. A federal district court judge has halted the U.S. Department of Labor's planned increase of the minimum overtime pay threshold, scheduled to take effect on December 1. The decision impacts employers nationwide, including townships. "It is unclear whether the decision will be appealed," PSATS General Counsel Scott Coburn says. "In the meantime, however, townships DO NOT need to follow through with the compensation and/or working hours changes they had planned to implement by December 1." For more information, townships can read this article or call the Association at (717) 763-0930. On December 19th, Rick Vilello, the Executive Director of the Governor’s Center for Local Government Services, an agency within the Pennsylvania Department of Community and Economic Development, will be holding a roundtable discussion for local government officials. This meeting will be at 6 PM at the Clarion County Human Service Building, Development Disabilities Conference Room - Ground Level, 214 South 7th Avenue, Clarion, Pa. 16214 and is open to all Clarion County elected and appointed local government officials. As the former four term Mayor of the City of Lock Haven, Rick has experienced many of the issues you are dealing with today. He is responsible for approving the many grant, loan and technical assistance programs available to you at the Governor’s Center and is interested in hearing your concerns. He is ready to offer you assistance and takes a hands on approach to solving problems. Rick has the tools and the authority to help you deal with the many complex issues local governments in Pennsylvania are facing today and is looking forward to meeting with you. Reservations are not necessary to attend this meeting but if you can, an email or phone call to let us know you are going to be there would be helpful. This workshop will showcase the process for permitting a vacant lot prior to construction activities. We will look at requirements for lot subdivision, Highway Occupancy Permitting (HOP), sewage regulations and other permits needed prior to the issuance of a building permit. The workshop will also cover Act 167 stormwater requirements such as a small project stormwater application, General Permits for impacts to wetlands and waterways, Erosion & Sedimentation Control plans, and NPDES (National Pollution Discharge Elimination System) Permits for stormwater discharges associated with construction activities. It is our pleasure to welcome you to the 11th Annual NW PA GIS Conference. This conference presents some of the best Geographic Information System (GIS) practices in our community today. ​Change is inevitable. Whether it is human induced or due to natural phenomena landscapes are always evolving. This year in the NW PA GIS Conference we are going to explore the data, tools, methods, and technologies used in detecting and tracking change. From the most commonly used remotely sensed imagery to the applications of Unmanned Aerial Vehicles (UAVs) in monitoring land change, we are going to explore the past, present and future of the subject matter. We all work to maintain a proper knowledge of our landscapes and we apply different methodologies to achieve our goals. So, regardless of your background, application, and/or affiliation, come and share your work with other professionals in an exciting and fruitful environment for education and networking. Register now. This course covers all aspects of winter maintenance operations. Topics include planning and organizing, public relations, material usage and application rates, equipment types and calibration as well as various operational procedures such as plowing and spreading. Other topics include CDL regulations, safety and environmental awareness. Also covered are the latest techniques in pre-wetting materials and anti-icing procedures for a more effective and economical operations. ​ Officials representing townships of the second class in Clarion County will convene, Thursday, September 15, 2016, at the Knox Fire Hall, Knox, PA for their 96th Annual County Convention. ​ The purpose of the annual convention is to provide township officials with up-to-date information to help them better serve their residents and to give them an opportunity to exchange ideas on local government issues. ​ The convention will feature a wide range of speakers, including Elam Herr, assistant executive director of the Pennsylvania State Association of Township Supervisors. Herr will talk about legislation affecting townships of the second class, association programs and services for townships, and issues of major importance to townships and their residents. ​ The State Association of Township Supervisors represents Pennsylvania’s 1,454 townships of the second class, 22 of which are located in Clarion County. Michael Forman, DCED Governor's Center for Local Government. The LTAP Warm Mix Asphalt Course has reached it's seating capacity and registration is now closed. CCATO is hosting a LTAP Warm Mix Asphalt Course on May 11th from 8:00 AM until Noon at the Clarion Township Municipal Building. Please call the Clarion Township Secretary at 764-5222 to register. This course provides relevant information to individuals who use plant mixed asphalt in their public works operations and projects. The course introduces the participants to the new technology that is being used to produce plant mixed asphalt at a lower temperature. This technology is currently being used by the asphalt industry nationwide. PennDOT entertains substitution of this material for the traditional Hot Mix Asphalt if certain requirements are met. Industry production trends necessitate its use by local government agencies. This course will provide individuals with the specifications Penn DOT utilizes for this material to assist them in their bidding projects and ordering maintenance material. In addition the participants will be provided with the temperature requirements for material delivery acceptance and compaction of Warm Mix Asphalt. Intended Audience: Local government officials responsible for planning paving projects or specifying and ordering asphalt material, personnel involved in the inspecting of paving projects, employees who utilize asphalt material to maintain streets and roadways. This includes Public Works Directors, Supervisors, Road Masters, Foremen and Equipment Operators. Intended Audience: Individuals involved in the maintenance of unpaved or gravel roadways such as: Street supervisors, roadmasters, crew foremen, and equipment operators. This class does not qualify a municipality to obtain dirt and gravel road funds, but rather teaches them how to better use such funds. This course covers the affect water has on roadways. Emphasis is on problems caused by poor drainage with discussion on various ways to handle these problems. Basic roadway drainage systems and their usage are reviewed. Industry standard procedures for replacing cross pipes are presented in detail. Regulatory agency policies and permit requirements are presented. The importance of performing routine inspection of drainage system assets is discussed with emphasis on the relationship to planning and Federal Aid reimbursement in the case of a disaster. Intended Audience: Individuals who are involved in the planning and execution of maintenance work on asphalt pavements, including: street superintendents, roadmasters, public works directors, crew foremen, and select crew members. Congratulations! You’re a township supervisor...are you FIT to handle the challenges you are about to face? Whether new to this position, or a veteran of township government, you are aware that your role as township supervisor requires a dedication to the public good and a commitment to your community. Obviously, you want to be sure your actions and decisions are the best for your township and its residents. Registering for this two-day training program proves your commitment to your new responsibilities. PSATS, your state association, has assembled an elite but down to earth team of experienced TRAINERS who will travel to 13 locations around the state in January, February and March of 2016 to train newly-elected township officials. This two-day program will leave you feeling conditioned to handle the duties your role of township supervisor will ask of you. Upon completion of this boot camp training, you will receive a certificate showing that you were trained in the duties and responsibilities of your elected township office. You will also receive a handbook for Township Supervisors that will serve as an excellent reference tool if you should falter in what the training taught you. Make sure you attend this specialized training, the only newly elected official boot camp designed solely for townships, so you can return to your township more prepared to take on the many challenges that await you as a township supervisor. Photos taken at the Liquid Fuels MS-965 Form Workshop hosted by CCATO. Presenters were Jim Schepis, PennDOT Municipal Services Specialist; Allen Williams, PennDOT Municipal Services Supervisor; and Mary M. Ammann, PennDOT Financial Consultant. Just Elected to Township Government? Now What? Did you miss the "Just Elected to Township Government ... Now What?" class? If you or your newly elected official(s) were unable to attend one of PSATS three December classroom locations, you have another chance to catch this valuable training opportunity. PSATS has had additional requests for this short session, which is NOT a replacement for the two-day Boot Camp but rather an introductory course to get you through your first organizational meeting on January 4. PSATS will be offering this class again on Wednesday evening, December 30, from 6:30 to 8:30 p.m. as a live, interactive webinar, which will allow you to participate from the comfort of your own computer. This session provides an introduction to township government and will give newly elected supervisors the tools they need to enter the organizational meeting with confidence. Participants will be able to call in and ask questions from our presenters during the training. If you would like to attend in person, the session will be held at PSATS Educational Center in Enola, Cumberland County. Register now to participate in this interactive webinar by clicking here. The Clarion County Association of Township Officials is hosting a Liquid Fuels MS-965 Form workshop. This workshop will act as a teaching course for those new to the secretarial position and a refresher course to those veteran secretaries. Jim Schepis, PennDOT Municipal Specialist, and Mary M. Ammann, PennDOT Financial Consultant are hoping that all secretaries in Clarion County will take advantage of this informative workshop. Registration: 9:30 a.m. -10:00 a.m.
Officials representing townships of the second class in Clarion County met on Thursday, September 17, 2015, at the Knox Fire Hall, Knox, PA for their 95th Annual County Convention. The purpose of the annual convention is to provide township officials with up-to-date information to help them better serve their residents and to give them an opportunity to exchange ideas on local government issues. Visit our convention page and click on 95th for photos. You are invited to participate in the 10th Annual Northwest Pennsylvania GIS Conference that will be held on October 15-16, 2015 at Clarion University of Pennsylvania. This event will once again be hosted by Clarion University. Please visit http://www.nwpagisconference.com for more information or for registration to attend, present and/or exhibit. Friday September 25th, 2015. Mark your calendar. Please pass along this information to anyone who may benefit from attending this event. Do not hesitate to contact Dr. Yasser Ayad (yayad@clarion.edu) for sponsorship opportunities, or for questions or comments. Looking forward seeing you at the Conference. This course covers all aspects of winter maintenance operations. Topics include planning and organizing, public relations, material usage and application rates, equipment types and calibration as well as various operational procedures such as plowing and spreading. Other topics include CDL regulations, safety and environmental awareness. Also covered are the latest techniques in pre-wetting materials and anti-icing procedures for a more effective and economical operations. 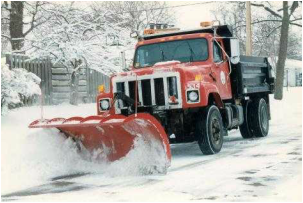 Intended Audience: All public works employees engaged in winter maintenance operations including: Street supervisors, public works directors, roadmasters, crew foremen and equipment operators. This course provides participants with 1) a basic understanding of intersection safety issues, 2) “How to” information for common safety tasks and low cost safety improvements that do not require an engineer, and 3) background information on safety tasks that DO require an engineer. This workshop also outlines areas where non-engineers can assist traffic engineers in the safety process, and help them to understand when an engineer needs to be consulted to make a safety related change at an intersection. This workshop is only intended to address existing roads; proposed roads are not considered because it is assumed that an engineer will be involved in design and planning of those. 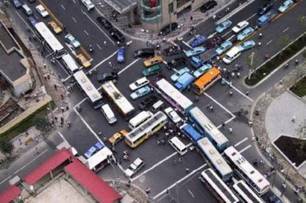 This program is not intended t...o make traffic engineers out of the general public. The minimum purchase amount that requires legal advertisements and sealed bids by Pennsylvania's townships of the second class are set to increase from $19,100 to $19,400 on January 1, 2015. In addition, the minimum purchase amount for telephone quotes will increase from $10,300 to $10,500 on January 1, 2015. These increases are due to Act 84 of 2011. The law requires the PA Department of Labor and Industry to adjust these amounts annually based on the Consumer Price Index for the 12-month period ending Septem﻿ber 30. Recently enacted Act 164 of 2014 requires elected tax collectors to appoint a deputy tax collector to temporarily act on behalf of the elected tax collector if they become physically or mentally incapacitated and are unable to perform the duties of office or resign. The appointment of the deputy is subject to approval by the board of supervisors and the elected tax collector’s bonding company. In this case, the deputy tax collector would collect any outstanding real estate taxes on behalf of the elected tax collector, acting under the tax collector’s bond. The appointment of the deputy should be made as soon as possible. Click on file below for more information about Act 164 of 2014, including a sample form to appoint the deputy. 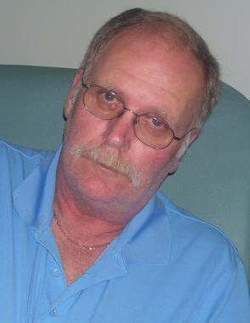 Jesse James Myers, age 56, of Sligo was called home to be with the Lord on April 17th, 2015 after complications from a valiant and courageous battle with cancer. Born on June 25, 1958, he was the son of the late James Junior Myers, and Norma J. Lewis, who survives. He married Debra Jean Norton on January 8th, 1983, and she survives. Together they celebrated 32 years of marriage. From that marriage, they raised two children, who survive; a son, Jonathan James Myers and fiancé, Brooke Fair, and a daughter, Alicia Leigh Myers Goodman. The family tree continued to grow and he was blessed with four grandchildren; Paige, Gavin, EmmaLeigh, and Hunter. Survivors also include his sister, Cindy Sue Myers Hawk; a brother, Douglas Alan Myers and wife Ruth Ann; mother-in-law, Ruby Norton; sister-in-law Darlene McNaughton and husband Donald; several aunts, uncles, nieces, nephews, great nieces, great nephews, and lots of special cousins. In Jesse's younger years, he had a very long career, working with many companies including Logue's, McCall's Egg Farm, Charlie Deitz Sandblasting, and Asplundh. He ran dozers for Bracken's Construction. He was then a project superintendent for Driggs, Branch Corporation, Bell Corporation, Miles Developing, New-Dominion, and Gorski. In his more recent years, he worked for Piney Township, where he was the township supervisor for 12 years. He served on the CCATO Executive Board from 2004-2012, as the vice president in 2006 & 2007, and as president in 2008, 2009, and 2010. In addition, he also served on the PSATS Rules Committee 2010-2012. He was also chosen to be a speaker at the annual PSATS Convention held in Hershey, PA.
Jesse will always be remembered for telling a good joke, and his sideways smile when he made you laugh. His hobbies included hunting, fishing, riding his motorcycle and in the side by side with a special friend Bill, Nascar, the Pittsburgh Steelers, and vacationing. But his biggest pride in life was his family. Jesse enjoyed most of all the life and legacy he leaves behind in his kids and grand-kids. Those closest to him knew the pride and joy he had for each of them. Even the young, but wise will tell you "Pappy will always live in my heart!" Jesse will forever be eternally grateful for the donor who made his stem cell transplant possible in December of 2013. The donor helped him beat the disease and gave him even more meaningful time in this life. He asks that those interested, consider joining BeTheMatch.org to aide in the fight for others. The family would also like to thank the Clarion Cancer Center, doctors, and Clarion-Forest VNA for their selfless care and help in this fight. At the request of Jesse, there will be no visitation, but instead, a celebration of life will take place on April 26th, 2015 at 3:00 p.m. at the Mt. Joy Methodist Church, 159 Mt. Joy Rd. (Wentlings Corners) Knox, PA with Rev. Daniel Myers officiating. The Clarion County 2015 Real Estate and Per Capita bills will be distributed late this year due to the transition into a new assessment tax software program. Traditionally the Tax Collectors would begin to distribute the tax bills on March 1st, but this year they will not be able to begin until approximately mid-March. Taxpayers will still have until April 30th to pay their bills at discount. Paying at face value is May 1 to June 30th and the penalty period begins on July 1st and runs through December 31st. The Clarion County Commissioners have adjusted the tax payment schedule due to the tax notices being distributed late this year. Click on button below to see adjusted schedule. For all those people who have ever thought about serving on their school board, borough council or township board, here's the chance to learn how to do it. Penn State Extension is offering a webinar "Toss Your Hat in the Ring" from 7 to 9 p.m. Monday February 9. The program includes: An overview of Pennsylvania local government and the responsibilities of a township supervisor, a borough council member, and a school board director. Instructions on how to run, including filing a petition, reporting campaign expenses and other important information. The webinar won't offer campaign tips or strategies; rather the focus is on understanding the roles, responsibilities and personal rewards that come with public service. "The people who run our local governments are our friends and neighbors people just like us," explained Judy Chambers, Penn State Extension educator. "You don't need special training or experience to serve your township, borough or school district. If you're interested in serving, care about your community, and are willing to learn on the job, we'd like to encourage you to toss your hat in the ring." In addition to the webinar, Extension is offering a two-hour workshop version of the program in 16 locations this winter. All workshops will run from 7 to 9 p.m. The fee for webinar or workshop is $25 per person. Details and registration information is available by visiting ﻿http://extension.psu.edu/community/ecd/courses/toss-your-hat-in-the-ring﻿ or by contacting Judy Chambers, Penn State Extension chambers@psu.edu or at 717-334-6271. As a municipal tax collector, you have many legal obligations and financial responsibilities that must be met in a timely manner. Whether you have served several terms in office or this is your first, you can set yourself apart from your peers by earning your Qualified Tax Collector Certificate. Achieving the status of Qualified Tax Collector indicates that an individual has proven his or her competence, knowledge and professionalism in the field. This two-day workshop, which focuses on real estate, per capita taxes, and the duties of the tax collector, will help new and veteran tax collectors achieve the designation of Qualified Tax Collector. Attendees must successfully pass the examination held on the second day to receive their certificate and become a Qualified Tax Collector. If your qualification has lapsed because you were unable to meet the continuing education requirements in 2012, you may retest. To reinstate your qualification, you must attend the review on day two and successfully pass the exam. The Clarion County Association of Township Officials is hosting a COSTARS workshop on Thursday October 30, 2014 from 9:00 AM-11:30 AM at the Clarion Township Building located at 17382 Route 322 just east of Strattanville, PA. Registration begins at 8:30 AM. Coffee and light refreshments will be available. To encourage, expand and facilitate the opportunities for eligible entities (members) to achieve procurement savings and best value through an interactive partnership with the Commonwealth. COSTARS Marketing Manager Kimberly Bullivant for PA Department of General Services will be in attendance to assist municipalities in building awareness about various opportunities that the COSTARS program provides. Ms. Bullivant as well as James Schepis, PennDOT Municipal Services Specialist will be available to answer any questions that you may have regarding the COSTARS program. Please RSVP no later than Monday, October 27, 2014 by calling the Clarion Township office building at (814) 764-5222 or emailing clartwp12@windstream.net . Preparedness, response, and recovery are three key words that have a tremendous significance in emergency and disaster management situations. GIS has played and will continue to play a great role in critical conditions where large amounts of data, spatial and non-spatial, are organized and prepared for the time it is needed most: Emergencies. Join us at the 9th Annual NW PA GIS Conference that will be held on October 16-17, 2014 at Clarion University of PA to participate in exciting discussions about how to improve our preparedness using geospatial technologies tools. Collaborate in a productive environment of training, sharing, and debating issues that pertain to data exploration and use, and spatial analysis methods and modeling techniques that are designed to help us improve our community preparedness for any unfortunate event that might rise in the future. Your colleagues will share their experience in project management, data modeling and strategies for disseminating data and knowledge. You will learn how other professionals are using GIS to integrate workflows, enhance communication, and build better partnerships. The Town and County Day would like to extend all local elected officials a special invitation to attend this event. This will be an excellent opportunity to see what Local Agriculture has to offer in terms of employees, economic impact and sustainable business opportunity. Agriculture is one of the major economic forces in not only western PA but also the entire state. This years event sponsored by the Holstein Club of Venango, Clarion and Forest Counties, will be held at Long Acres Farm located on Route 36 near Tionesta, PA. The event is scheduled for Saturday August 23 from 12 to ? and is FREE and OPEN to the Public. Town and County Day will showcase not only Long Acres Operations and facilities but will also feature other agriculture and related displays and demonstrations as well as opportunities to have just plain good county fun. The line up of events will incude: Farm Tours, Hay Rides, Straw Maze, Kids Activities, PA State Farm Bureau Mobile Educational Ag Lab, Antique and Current Farm Exhibits, "Big Rig" Truck Exhibts, Food Vendors from local service organizations, Potato dig contests, Free Ice Cream and Milk, Petting Zoo, Pony Rides, Raffles, Bossey Bingo, and Much Much More. Local and state elected officials, Economic Development and PA Wilds representatives are slated to attend. Secretary of Agriculture Dennis Greg is also slated to speak at the event. Could some grant money help get a new program off the ground for your organization? Need funding for a capital project? Penn State Extension is offering a program on grant-writing for groups including faith-based groups, municipalities and non-profit organizations seeking financial support for a project. The three-hour program addresses how to work effectively with foundations, components of an effective proposal, evaluation strategies, and how a grant proposal is reviewed. The program will conclude with a panel of representatives from local foundations. The program will be held from 9 AM to noon Friday, June 13, at Penn State Extension Clarion County, 8 Grant St., Clarion. Registration deadline is Wednesday, June 11. For more information, contact: Liesel Dreisbach at ldreisbach@psu.edu, or by calling 610-746-1970. 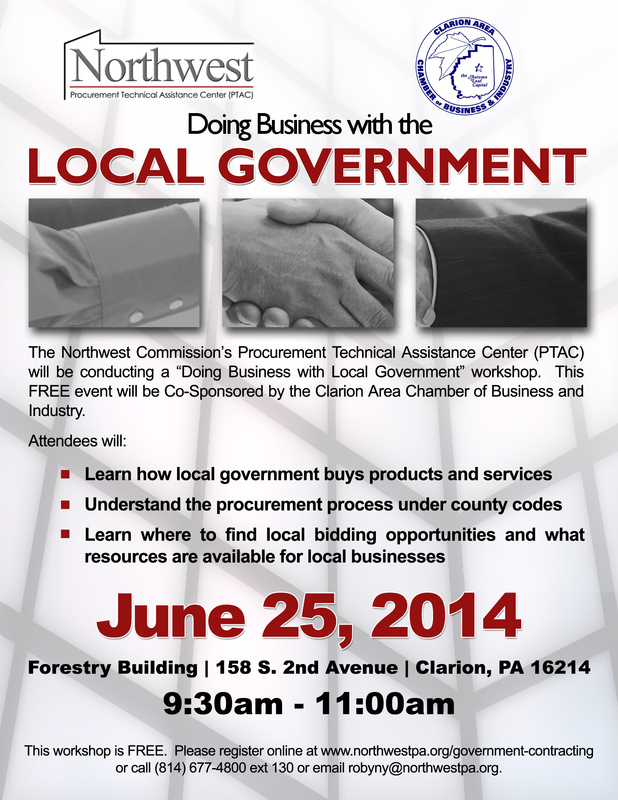 The Northwest Commission's Procurement Technical Assistance Center (PTAC) will be conducting a "Doing Business with Local Government" workshop. This FREE event will be co-sponsored by the Clarion Area Chamber of Business and Industry. Individuals and businesses who own or plan to build a structure that is wholly or partially located within a floodplain are likely to be required to purchase flood insurance. One part of the procedure to purchase flood insurance is the completion of the Federal Emergency Management Agency’s (FEMA) Elevation Certificate. Depending on the particular circumstance, the property owner is likely to require the services of an engineer, surveyor or architect to certify the required elevation information. In an effort to assist the residents and businesses located in Clarion County, the Clarion County Commissioners, the Office of Emergency Services and the Department of Planning and Development are establishing a list of engineers, surveyors and architects who are interested in preparing the Elevation Certificates. On Thursday, March 20, 2014, Richard Sobota, Insurance Specialist with FEMA Region 3, will explain the requirements to our local municipal officials and other interested persons. This meeting is scheduled for 3:00 PM at the Fraternal Order of Eagles, 81 Stone House Road, Clarion, PA 16214. We will then post a list on Clarion County’s website of the persons who are available to help. If you would like to attend this FEMA training and be included on Clarion County’s list, please contact Twila, Director of the Department of Planning and Development, either by e-mail (trifenberrick@co.clarion.pa.us) or telephone (814-226-4000, Ext. 2800). This article is courtesy of the Pennsylvania Township News magazine. Three decades ago, Linda Spoharski was a stay-at-home mom with an ideal job. As the secretary for Richland Township in Clarion County, she could work from home with the municipal building in view of her back porch. Even better, the part-time position allowed Spoharski to be there waiting when her four children arrived home on the school bus. Since then, her kids have grown up, moved away, and had children of their own, but one thing hasn’t changed: She is still working for the township. “In the beginning,” she says, “I took the job because I could work from home — it fit my lifestyle at the time — but it’s turned into much more than that.” Now, public service is a significant part of her life. Today, the secretary splits her time between the two municipalities, where she has taken on additional responsibilities over the years. In Salem Township, for instance, she not only handles much of the paperwork but also serves as the municipality’s emergency management coordinator and code enforcement officer. The right-hand woman to the supervisors and the only office employee in each of these small townships, which have about 1,200 residents between them, Spoharski is happy to be their “go-to” person. That may mean attending meetings with the county commissioners on behalf of the supervisors, ordering blacktop, or preparing bids. Usually, though, she’s fielding calls from residents, who have learned to rely on her. “The other day a lady called with a problem, and she really needed to talk to our tax collector,” Spoharski says. “I asked her if the collector’s name was on the form she had, and she said, ‘Yes, but I don’t know her. I know you.’” The secretary pauses for a moment and laughs. “My kids joke with me all the time. They say, ‘Mom, everywhere you go, you know someone.’ All the residents know my name, and they think I can fix anything.” And you know what? Spoharski knows many of their names, too — an advantage, she says, of living in a small township. You are invited to participate in the 8th Annual Northwest Pennsylvania GIS Conference that will be held on October 17-18, 2013 at Clarion University of Pennsylvania. This event will once again be hosted by Clarion University. Exciting presentations from varied participants in the field. Exhibitors from renowned national and regional companies and agencies. Other events that will be available and advertised for on the conference’s website soon. Please visit www.clarion.edu/gisconference/ for more information or for registration to attend, present and/or exhibit. Officials representing townships of the second class in Clarion County will meet Thursday, September 19, 2013, at the Knox Fire Hall, Knox, PA for their 93rd Annual County Convention. The purpose of the annual convention is to provide the officials with up-to-date information to help them better serve their residents and to give them an opportunity to exchange ideas on local government issues. be representatives of county, state and national government. For more info go to the 93rd Annual Convention page. Attend Pennsylvania 811 Safety Day on September 12! LTAP would also like to recognize Elk Township, Clarion County, which received the second highest score for its antiskid remover for under guide rails. During winter maintenance months, antiskid material collects under guide rails and storm-water runoff does not remove it. 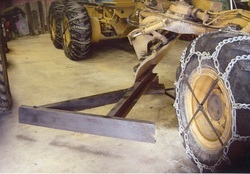 The road crew created an apparatus that mounts to the mold board of a grader to push and remove material from under the guide rail. The new tool cost the township about $50 in materials, plus six hours of labor. This mechanism allows the township to complete cleanup at one-fifth the cost of doing it manually. LTAP thanks each municipality for its entry and encourages every township to submit an entry next year. Farmington Township in Clarion County received the first runner up award in the 31st Annual Road and Bridge Safety Improvement Contest, presented at the 91st Annual Educational Conference of the Pennsylvania State Association of Township Supervisors (PSATS) in Hershey April 21-24. The conference attracted attendees from every county in Pennsylvania except Philadelphia, which has no townships. Farmington Township was recognized for a bridge replacement project. 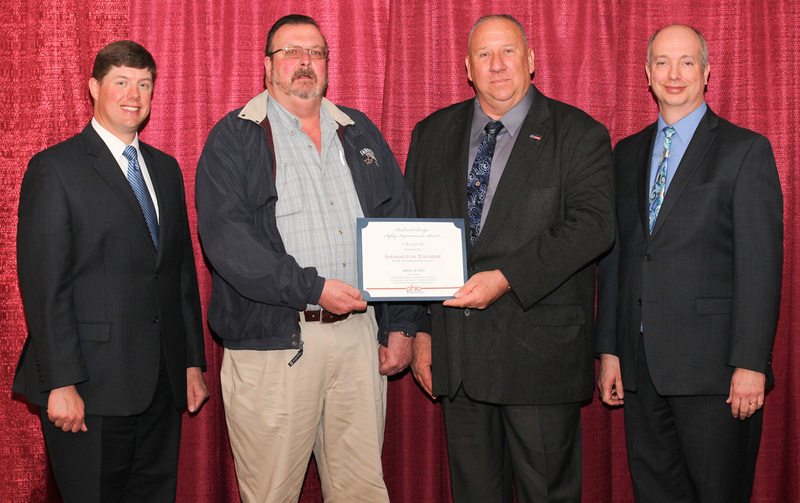 Farmington Township received its award for replacing a bridge on Lencer Drive that was in poor condition and had been recommended for closure by PennDOT District Municipal Services. The township installed a temporary bridge in January 2012 to keep the road open while exploring cost-effective options to repair or replace the deteriorating structure. The road is fairly heavily traveled and is a school bus route, township road master Francis Allio says. Once school was out for the summer and all the permits were in place, the township prepared to tear out the old bridge and install an aluminum box culvert. Using a prefabricated aluminum structure instead of concrete was a large cost savings, he says. It was also a better option because the bridge crosses a high-value trout stream and the metal doesn’t deteriorate like concrete. With the help of Municipal Services and grants from Clarion County’s liquid fuels funds and the state’s Dirt and Gravel Road Maintenance Program, the township was able to replace the bridge for one-fifth of the cost of the original estimate. The grants covered about 42 percent of the $114,000 cost to replace the bridge and cover the approaches with driving surface aggregate, Allio says. Aside from a contractor for two days and engineers, the township road crew did most of the work, saving even more money. “Everyone worked well together to complete this project,” he says. “The township crew, state and county government, even the township secretary was very helpful." New rules for disposing of electronic devices that take effect on January 24, 2013, will prohibit consumers from throwing away laptops, computers, monitors, televisions, and other such electronics with their trash. Under the state Covered Device Recycling Act of 2010, waste haulers will no longer be able to take these items unless the municipality has a curbside electronics collection program that ultimately sends the devices to an electronics recycler. "Proper recycling is important because there are millions and millions of devices, they have a limited useful life span, and they contain heavy metals, such as lead, cadmium, and mercury, as well as other materials that do not belong in the normal trash stream," state Secretary of Environmental Protection Michael Krancer said in a news release. Many of these devices also contain valuable metals, such as gold, silver, and platinum, and base metals, such as copper, iron, and aluminum that can be separated and reused in new products. The law also requires manufacturers of covered devices to provide for the collection, transportation, and recycling of these items through one-day events, permanent collection programs, or mail-back options. Some retailers also accept electronics for recycling either at no charge or in exchange for rebates or coupons. hotline at (800) 346-4242. Consumers may also obtain electronics recycling information from their county recycling coordinator. Contact information for county recycling coordinators can be found on the DEP website at www.dep.state.pa.us, keyword "Recycle." The following Clarion County township officials attended the 91st Annual Educational Conference and Trade Show of the Pennsylvania State Association of Township Supervisors April 21-24 at the Hershey Lodge, Hershey, PA.
More than 4,000 township officials, exhibitors and guests participated. The conference provides township officials with information to help them better serve their constituents and gives them an opportunity to exchange ideas on important local government issues. Heading the list of notables who spoke were Gov. Tom Corbett, Lt. Gov. Jim Cawley, Senator John Eichelberger and PA State Police Commissioner Frank Noonan. The proposed increased in transportation funding for state and local roads and bridges and mass transit was a key issue during the conference. Conference attendees also heard from keynote speaker David Horsager, best-selling author of The Trust Edge: How Top Leaders Gain Faster Results, Deeper Relationships and a Stronger Bottom Line. During the conference’s business session, delegates adopted resolutions establishing the official policy of the Sate Association. These resolutions will serve as guidelines for the Association in pursuing legislation and resolutions favorable to townships. The Pennsylvania State Association of Township Officials has been serving the state’s 1,455 townships of the second class since its creation by the General Assembly in 1921. Townships of the second class represents more residents—5.5 million Pennsylvanians—than any other type of political subdivision in the commonwealth. The Clarion County township officials in the photograph were among the many municipal officials to travel to the State Capitol during the 91st Annual Educational Conference and Trade Show of the Pennsylvania State Association of Township Supervisors April 21-24 to meet with state lawmakers. More than 650 township officials attended the PSATS’ Annual Legislative Reception that brings local and state officials together to discuss issues and concerns. Top priorities for PSATS members included increasing funding for local roads and bridges; eliminating unfunded mandates; reforming the Prevailing Wage Law, which is imposed on a broad range of road projects and driving up local costs; and amending costly laws that govern road bonding and legal advertising. The state Department of Agriculture co-sponsored the event and the food was provided by members of PA Preferred, a program that promotes products grown and manufactured in Pennsylvania. Clarion County’s Office of Emergency Services is in the final stages of updating the county’s Hazardous Mitigation Plan. The plan is designed to identify actions the county can take to reduce potential for future damages that result from hazards and reduce or eliminate long term risks to buildings with in the county. In an email exchange with the CLARION NEWS, Clarion County Commissioner Butch Campbell recently said county municipalities are currently reviewing a draft of the plan for a final review and comments. updates to it,” Campbell wrote. In addition to a Hazard Vulnerability Summary, twelve hazards are specifically addressed in the Hazardous Mitigation Plan. These hazards are drought, earthquake, flood – including flash flood and ice jam – landslide, subsidence and sinkholes, tornado – including wind storms – winter storms, wildland fires, extreme temperatures, solar weather, radon, and oil and gas wells. Three public meetings will be held to discuss the Hazardous Mitigation Plan. The meetings will be 7 p.m. April 3 at the Main Street Center in Clarion, 7 p.m.
April 4 at the Antler Club in Lucinda, and 7 p.m. April 8 at the Korner Restaurant in Sligo. A copy of the Hazardous Mitigation Plan is available in the commissioners’ office for public review. Randy Vossburg, supervisor of Paint Township has been appointed to the townships under 2,000 population committee of the Pennsylvania State Association of Township Supervisors. The townships under 2,000 population committee identifies common problems and needs unique to smaller townships, proposes solutions through state and federal legislation and administrative initiatives and facilitates the exchange of information through discussion, training and technical assistance. Jesse Myers, a supervisor in Piney Township, Clarion County, has been appointed to the rules committee of the Pennsylvania State Association of Township Supervisors. The committee writes and amends rules for the conduct of all association meetings and submits recommendations for amending the association’s bylaws. preserving and strengthening township government and securing greater visibility and involvement for townships in the state and federal political arenas. Townships of the second class represent more residents – 5.4 million Pennsylvanians – than any other type of political subdivision in the commonwealth. The Clarion County Association of Township Officials will be hosting a workshop for township and borough officials covering the Marcellus Shale Gas Impact Fee Funds, PennDot Liquid Fuel Funds and the Clarion County Stormwater Management Ordinance. The workshop is scheduled for Wednesday March 20, 2013 from 9:00 AM—Noon. The workshop will be held at SMI meeting room in Strattanville, PA. Please RSVP to the secretary by March 19, 2013 if you are planning to attend. The County Commissioners are scheduled to approve the Amended Clarion County Stormwater Management Ordinance, Memorandum of Understanding (MOU) between the County Commissioners and the Conservation District and fee schedule at their regular meeting on February 26th. After these items are adopted by the Commissioners, municipalities who are interested in being included in the County Stormwater Management Ordinance will need to pass a resolution at their monthly meeting in March. After your resolution is passed, please submit a copy to Kristi in the Planning Department. If your municipality is not interested in being included in the County’s Ordinance, you will have to adopt your own municipal Stormwater Management Ordinance by the March 1st deadline set by DEP. The Pennsylvania Public Utility Commission has further clarified various portions of its implementation of Chapter 23 of Act 13 of 2012, which provides for the imposition of an unconventional gas well fee. The Commission clarified that budget reports from local governments receiving impact fee monies are due March 1 of each year. Generally, the annual budget report will reflect a municipality’s final approved budget for the prior fiscal year. However, for the upcoming year’s deadline, March 1, 2013, the municipal budget reports for both 2011 and 2012 must be filed with the Commission. In subsequent years, only the prior year’s final approved budget report will be due. For example, the municipal budget report for 2013 will be due on or before March 1, 2014. The Commission also voted to provide further clarification on issues such as whether setting conductor pipe triggers the impact fee; how impact fees will be assessed to wells that are reclassified from horizontal to vertical; and when the impact fee ceases after a well is plugged. On Feb. 14, 2012, Gov. Tom Corbett signed into law Act 13 of 2012, the Unconventional Gas Well Impact Fee Act, which amended Title 58 (Oil and Gas) of the Pennsylvania Consolidated Statutes. The PUC is responsible for implementing the provisions contained in Chapters 23 and 33 of the Act. Chapter 23 provides for the imposition, collection, and distribution of an unconventional gas well fee (also called a drilling impact fee). Chapter 33 governs local ordinances that impose conditions, requirements or limitations on oil or gas operations. The PUC has created a page on its website for Act 13 information. The Internal Revenue Service has announced that its 2013 optional standard mileage rate for business miles driven will be going up 1 cent from the 2012 rate to 56.5 cents per mile. The new rate takes effect January 1.Township supervisors may implement this change by motion at a public meeting. If the board of supervisors establishes a mileage rate lower than the IRS rate, officials and employees may deduct the difference when filing federal taxes. The board may also establish a mileage rate higher than the IRS rate, but this would be considered taxable compensation. The minimum purchase amount at which townships are required to advertise for bids will increase from $18,500 to $18,900 on January 1, 2013. In addition, the minimum purchase amount for telephone quotes will increase from $10,000 to $10,200. These increases are due to Act 84 of 2011. The law, a long-time priority for PSATS and its members, requires the Pennsylvania Department of Labor and Industry to adjust the bidding thresholds annually based on the Consumer Price Index for the 12-month period ending September 30. Article VI, Section 602, of the Township Code requires all township boards of supervisors to meet on the first Monday of January to organize. That will be January 7 in 2013. The session must be open to the public and may be considered a regular monthly meeting for the transaction of business. Time must be allotted for public comment, just as in a regular meeting. For tips on developing your township's organizational meeting agenda, see Page 57 of the December, 2012 Pennsylvania Township News. For a checklist for your organizational meeting click on Checklist. Also, township auditors meet Tuesday, January 8. The Clarion County Commissioners approved Dec. 11 nine liquid fuels grant awards to county municipalities totaling $132,250. Commissioner Wayne Brosius said the decision to award grant requests was based upon need. “We went out and looked and checked out some roads and other situations to make some decisions,” Brosius said. While nine municipalities received funding for their requests, some requests remain unfunded. “A few liquid fuels grant requests were turned down because we simply didn’t have enough money,” Brosius said. In making these decisions, Brosius said the commissioners considered how recently each municipality had received funding from other liquid fuels grant requests. “We take into account who received money recently and if you got money the last time you probably did not this time,” Brosius said. Municipalities receiving funding for various projects include: Ashland Township, $30,000, for a double seal coat along Ninevah Road and an intersection. Piney Township, $20,000, for three inches of 19 millimeter super-pave binder course for approximately one-half mile along McCall Road. Perry Township, $18,000, for oil application along various township roads. Beaver Township, $17,250, for the purchase of a plow and truck. Elk Township, $15,000, for the widening of Pine City Road. East Brady Borough, $15,000, as an additional request for funds for the completion of Ferry Street paving. Limestone Township, $6,000, for replacement of culvert pipe along Love Road. Millcreek Township, $6,000, for the purchase of a road rake. St. Petersburg Borough, $5,000, for installation of parallel pipes, inlets, and boxes for Emlenton Street and Mill Street. WPPSEF is a non-profit 501(c)3 organization that is focused on providing investment capital to fund clean energy projects throughout the 23-county Allegheny Power territory. We are currently seeking to fund clean energy projects in Clarion County that parallel our mission and benefit the West Penn Power service region. WPPSEF is hosting a workshop on Monday, December 17 from 9 a.m. – 10 a.m. at the Clarion SBDC. This is a nice opportunity for Clarion County municipalities or local businesses to learn how they might be able to take advantage of some investment funding that is available for clean energy projects. It is a quick presentation about who we are and what we have funded in the past and how we might be able to help local businesses. This is a free workshop. It lasts about an hour and we are providing a light breakfast. Every five years, Clarion County’s Office of Emergency Services must put together and update its Hazard Mitigation Plan. The plan is designed for the prevention and minimization of injury and damage caused by a major emergency or disaster within Clarion County. Parts of that plan are various Hazardous Materials Emergency Response Plans for specific incidents. Clarion County Emergency Management Coordinator Randall Stahlman said these plans will become annexes to the county’s Emergency Operations Plan. “This identifies possible hazardous areas and what our plans are,” Stahlman said. The plans also include all transportation incidents, not just those involving roads. All municipalities must have a plan in place to address disasters, and each can choose to go along with the county’s plan or form their own plan. “Municipalities do have the option to write their own plan, but it really isn’teconomically feasible for them to do that,” Stahlman said. “All municipalities should participate in this, because if they do not and there is a disaster in the county, they will not receive any (federal or state) funding.” Stahlman said the county’s plan will have a section for each municipality. As a part of the county’s Hazard Mitigation Plan, Clarion County OES will be hosting three public meetings to discuss how each municipality can participate in the county’s efforts. The meetings are scheduled for 7PM on Oct. 22 at the Antler Club in Lucinda, 7PM Oct. 23 at the Sligo Presbyterian Church in Sligo and at the Main Street Center in Clarion at 7PM Oct. 24. Officials representing townships of the second class in Clarion County will convene Thursday, September 20, 2012, at the Knox Fire Hall, Knox, PA for their 92nd Annual County Convention. The purpose of the annual convention is to provide township officials with up-to-date information to help them better serve their residents and to give them an opportunity to exchange ideas on local government issues. At the convention there will be 29 exhibitors and their representatives displaying their products and services. In attendence will be representatives of county, state and national government. Also they will be presenting their annual awards to the Outstanding Township and the Outstanding Individual. Paint Township will doing an Oil & Chip Project using a fiberglass applied with the oil to help stabilize the road surface. The project will be held on Amsler Road across from the PennDOT garage near the intersection of Routes 66& 322 on Tuesday, June 26 about 8:30 AM. The project will be done by Jefferson Paving Corp. and Midland Asphalt Materials, Inc.'s Fibermat All are invited to watch this demonstration. A meeting with a representative of Perma-Zyme, used for dust control and to build up roads, will be held at the Pinegrove Volunteer Fire Department. Supervisors in Clarion County have been invited. The meeting will be Saturday, June 9, 2012 at 4:30 PM. Directions to the location can be found by clicking on the event on the calendar to the right. The following Clarion County township officials attended the 90th Annual Educational Conference and Trade Show of the Pennsylvania State Association of Township Supervisors May 6-9, 2012 at the Hershey Lodge, Hershey, PA. Heading the list of notables who spoke were Gov. Tom Corbett, Lt. Gov. Jim Cawley, Speaker of the PA House of Representatives Sam Smith, Secretary of Environmental Protection Michael Krancer, Secretary of Transportation Barry Schoch and Pennsylvania Public Utility Chairman Robert Powelson. The event also featured two panel discussions: one on the prevailing wage, which PSATS wants lawmakers to repeal or reform; and the other on ACT13of 2012, the Unconventional Gas Well Impact Fee Act. Key figures involved in both issues shared their views and answered township officials’ questions. Conference attendees also heard from keynote speaker Scott Taylor, a Navy Seal turned businessman, who shared his inspirational story. Here you can find a summary of the main features of Act 13 and proposed unconventional well impact fees. This summary was prepared by PSATS shortly after the legislation was enacted, and does not include all of the provisions of the 174 page legislation.